And yes, we all want to be “looking fly in the streets,” Scott. We certainly do. The 3ST.004 will be in specialty retailers and Adidas online starting February 7, 2019. If you’ve got $120 they can be yours. Surprisingly, and totally unprompted on Memorial Day we happened to re-watched Thrashin’, the movie that mythologized the “Venice Pit.” Synchronicity? We wouldn’t rule it out. adidas Skateboarding releases their newest skate edit, “RŌZU” or “Rose”. The brand’s latest video features the global team taking to the streets of one of their favorite cities – Tokyo. Dennis Busenitz, Silas Baxter-Neal, Rodrigo Teixeira, Mark Suciu, Gustav Tønnesen and other team riders. Yeah? Daewon Song, Blondey McCoy, Na-Kel Smith, Nestor Judkins and Dennis Busenitz hit the courts for the Adidas Matchcourt RX. Such a nice way to sell tennis shoes, idinit? They are called Matchcourt Mid’s (guess they’re repurposed old Adidas tennis shoes or something). But they’re skate shoes now, thanks to Marc Johnson and his funny, funny ways. Pantone 542, the official school color of the University of North Carolina, known as “Carolina Blue”, serves as the inspiration for the signature colorway of the Matchcourt Mid x MJ. The blue pays homage to Johnson’s home state and skateboarding roots. It’s good to see downtown photographer Ari Marcopoulos still hangin’ with the action crowd. His current incarnation features a collab with adidas skateboarding. Central to the collection is a specially made zine “AIGHT’.” Masterminded by Marcopoulos, the zine is 26 pages capturing a winter day of skateboarding in New York City’s Lower East Side neighborhood and features an amalgamation of mixed media, vibrant color pops and signature aesthetic made consistent throughout the entire collection. Capturing select members of the adidas Skateboarding team, “AIGHT'” is a modern take on Marcopoulos’ early and now iconic work capturing the unique styles and personalities of New York skateboarders during the 1990s Golden Era of skate. Ari’s photos are always good to see, especially when he’s in charge of their presentation. Watch for more details on the actual product drop on February 27, 2017.
adidas Skateboarding hosted an old school West Coast day party that included a special DJ performance by Snoop Dogg, the ‘LA Stories’ collection on display, and a lowrider show that also featured Snoop’s custom lowrider that was painted by Gonz, whose art is featured throughout the ‘LA Stories’ capsule collection. adidas Pro team riders Daewon Song, Na-Kel Smith, Tyshawn Jones, and Jack Fardell alongside influential tastemakers, industry executives, prominent media, and ecstatic fans, also enjoyed specially prepared Snoop x Gonz donuts fresh from the oven compliments of Randy’s Donuts. Doesn’t seem possible to manufacture a better event, right? Atiba Jefferson and Skin Phillips were even there. 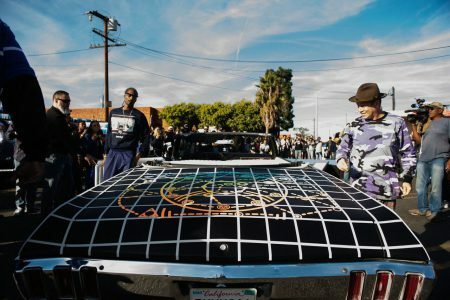 We just wonder how Snoop really feels about his new Gonz paint job? The collection is inspired by the the duo’s deep connection to Los Angeles style beginning with a customized Matchcourt Mid. 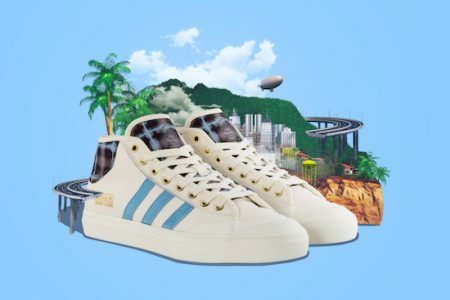 Constructed with a full-grain, buttery cream leather upper, the shoe features the iconic three stripes in a blue hue, custom sockliner, gold eyelets and is detailed with signature artwork by Gonz on the outsole. In the 90s, plaid flannels were wardrobe staples for Snoop and Gonz and the digitized plaid tongue and heel overlay designed straight from Gonz’s iPad was its inspiration. Gonz’ custom artwork also appears on the limited edition hoodie, long sleeve shirt and t-shirt featuring lowriders and graffiti lettering. The shoes retail for $85 and the clothing pieces start at $30 and will be available at Adidas.com and a select specialty skate retailers. In other words, you can get these at the outlet mall. Capita Snowboards and adidas Snowboarding share a rider. His name is Kazu Kokubo. So why not share some branded product as well? No reason, really. So here it is — a Adi-Trek Capita shoe and Coaches Jacket — inspired by Kazu’s board graphics which were created by world renowned tattoo artist Gangi of Three Tides Tattoo. 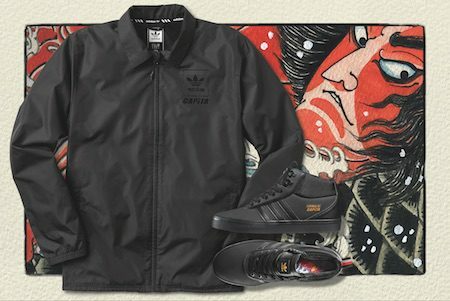 This smashing combo goes on sale October 1 at specialty retailers in the US and on the adidas snowboarding website: $90 for the shoes, $95 for the jacket. Go Capita! When a footwear company is known for making sports shoes there’s no reason for them to leave their heritage behind just because they’re also into skateboarding, right? Well, that’s apparently what adidas believes. And that’s why their new Adi-Ease Premiere Universal skate shoes look so much like their soccer shoes. Inspired by the iconic soccer shoe “Universal,” the shoe bridges rich adidas heritage with modern street skating. 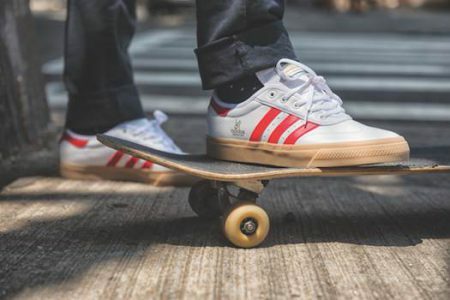 The Adi-Ease Premiere Universal takes detailed design cues from the Universal yet maintains the silhouette and board control of the popular Adi-Ease Premiere skate shoe. The updated Adi-Ease features a premium full grain leather, deco stitch toe and a PU Molded sockliner. 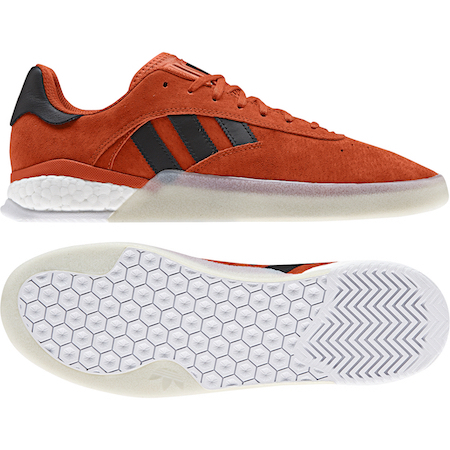 The Adi-Ease Premiere Universal comes in two colorways of White/Scarlet (above) and Core Black/White and is available for purchase through specialty retailers and the adidas Skateboarding website for $90.